Congratulations are in order for all of the cast and crew of the Camillus Middle School musical, Suessical. The students performed well, and the parents also performed well driving in our first mini-snowstorm! Speaking of storms, our girls swim team stormed the pool at the state finals! Olivia Castro finished ninth in the 200 freestyle, and 11th in the 100 freestyle. The Wildcats’ 200 freestyle relay team (Sinead Guy, Olivia Castro, Brianna Smith, and Kaitlin Dunning) came in 11th, and the 400 freestyle relay team (Sinead Guy, Rebecca Kanoza, Brianna Smith, and Olivia Castro) finished 10th. In the team standings, West Genesee had the best finish of any Section III school, 14th in both the federation and public schools results. We are really proud of all that the swim team has accomplished. 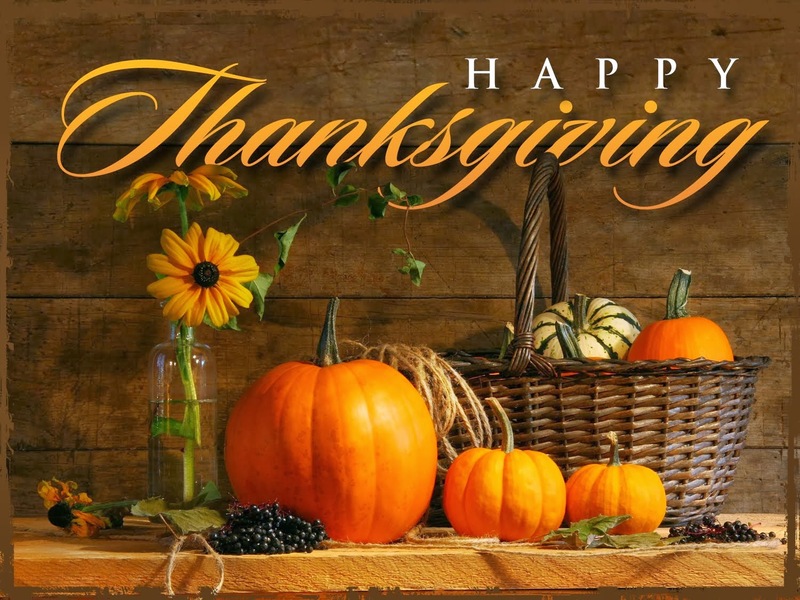 We have a short week ahead that leads us to Thanksgiving, and we have a lot to be thankful for: family, friends, a supportive community, and each other. 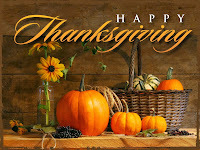 I hope that you are able to take time later this week to give thanks. If you are able to give a little to someone in need please do so, and if you need help please reach out because there are plenty of people willing to help. Enjoy the week and thank you for your support. The past weekend was a gift on many levels. I was able to get a lot of yard work done, but more importantly many of our students were spread out across Syracuse and beyond representing our West Genesee Community. Cross Country Runners at Federation Championship/Girls Swimmers to Compete at State Championships - There were several cross country runners (Laura Leff, William Randall, Jack Erhard, David Leff, Michael Richards, Michael Lannon, Jr., Matthew Romano, Nathan Conroy, and Sean Beney) who had a chance to compete in the Federation Championship in Wappingers Falls, NY. Our students placed very well compared to other runners from across the state. We also still have girls swimmers competing this coming weekend at the state championships in Ithaca Congratulations to these awesome athletes! Honk! Jr. Swims into West Genesee Middle School - Many talented West Genesee Middle School students performed on Friday night and Saturday afternoon in a musical called Honk! Jr. Christy Knowlton and the gang always put on a great show. I am looking forward to checking out the video as soon as I can get my hands on it! Split Rock Chorus Sings at Crunch Hockey Game - Lastly, members of the Split Rock Elementary School fourth-grade chorus had an opportunity to sing the National Anthem at the Syracuse Crunch hockey game on Saturday night. They did such a good job that it earned them the honor of "Anthem of the Week" by syracuse.com. See the video embedded below. Pretty cool! National Honor Society Induction - I am excited to induct mid-year members of the National Honor Society (NHS) tonight. The NHS is one of my favorite evenings because being inducted is not the end for these students. They have to live by the traits of service, scholarship, leadership, and character each day in order to keep this award. These traits really help our students to develop into responsible young adults, and I congratulate them and their parents. Keep up the good work! Freshman Sings at SU Game - Also tonight, high school freshman Caitlin Barry will be singing the National Anthem in front of over 20,000 people at the Syracuse University vs. St. Francis basketball game. Wow! Look forward to the video on our Facebook page on Tuesday! Camillus Optimists Honor Teachers/Youth - On Tuesday night I get to help recognize the Camillus Optimists Students and Teachers of the Year. This year our Students of the Year are Emily Cook and Michael Richards from the high school, Sophia Valerino and John Howes from Camillus Middle School, and Kyle Jenkins and Grace Walker from West Genesee Middle School. Teachers who are being honored are Melanie Callahan from Split Rock, Kathleen Byrne from WGMS, and Leandra Kovalchik from the high school. Nice work and I am looking forward to celebrating with our recipients and their families. Suessical the Musical at Camillus Middle School - The week ends with the Camillus Middle School Production of Suessical, which I am sure will be as excellent as Honk! Jr. Wow, what a week ahead! For those keeping an eye on the Commissioner, do not think for a second that I have taken my eye off of that situation. His talk of local schools giving fewer tests (if parents are angry about testing) and broaching the topic of K-2 standardized testing, as well as his slow implementation of some pretty easy suggestions from parents and educators in the field, has "poked the bear". I will let you know how we can strike back in the coming weeks. Have a wonderful week, and I hope to see you around. This is just a quick post to thank you again for your overwhelming support of our Capital Project Referendum and establishment of a reserve account to eventually replace our turf field. Those who were able to come out and vote braved some obnoxious weather for this time of the year. I want to thank all of our volunteers for working the polls and especially Hugh Stannard, who at 97 years old drove, himself to the school to help voters use the machines as he has done for a long, long time! Your service is MUCH appreciated. Where do we go from here? Great question. 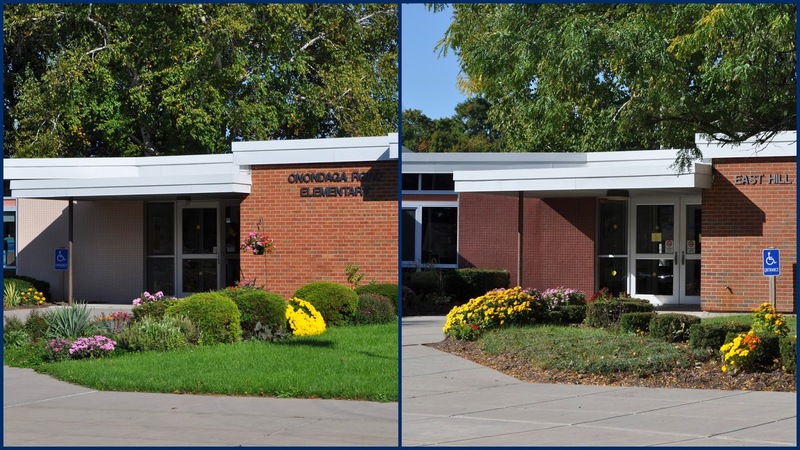 As you know, the project calls for technology and security upgrades at all buildings, renovations of all buildings, and additions at Onondaga Road and East Hill Elementary Schools. We are also looking to maximize our money so we have the least impact on taxpayers ($5.19 or less per $100,000 of assessed home value). 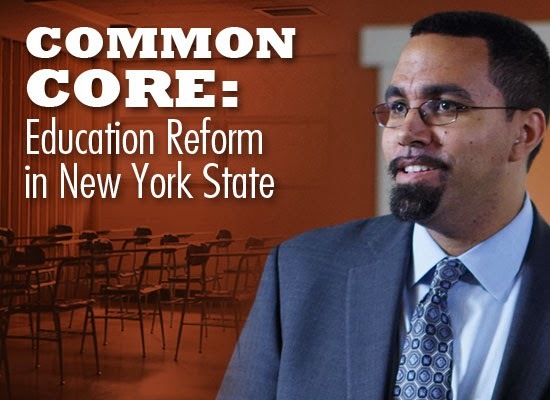 The first step in the process is to have formal plans approved by the New York State Education Department (NYSED). This can take up to four months at a minimum. NYSED is backlogged and understaffed, and my experience has been that the harder I have pushed to get plans approved, the further down the pile the plans have gone. Once the plans are approved, we will send what are called "bid specifications" out to general contractors and sub-contractors. They will have approximately two months to look things over and let us know through a sealed bid how much the job would cost for them to complete the work. We then open the bids and reward the work. By now we are into May or June if all goes well. 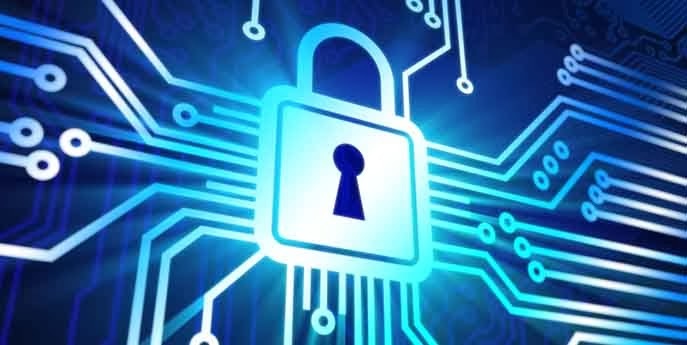 We will begin the technology and security upgrades by the end of June, which are scheduled to be finished first (at this point I do not want to guess on an exact completion date). The first shovels for renovations and additions will hit the ground by July or August, if all goes perfectly. There are many more little details to attend to during this time, but this is a blog not a book! Based on past experiences, I would expect this entire project to take about two years to complete. However, you will see substantial completion of some aspects of the project by this time next year. We always talk about how much things are going to cost, but we are also going to track savings as well. 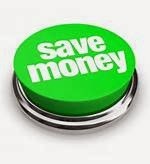 We think we can save hundreds of thousands of dollars just by changing our phone system, for example. We will also save tens of thousands by converting regular parking lot lights to LED lights, and we will save tens of thousands on our utility bills by upgrading boilers even though we are ADDING air conditioning to the elementary schools. It is important to track savings for you because many of the utility and technology updates we are doing can be done on a much smaller scale in your own home. For example, I was amazed at how much money LED lights can save. So I converted most of my own home to LED lighting about a year ago, and I am saving at least $100 per month on my own utility bill. That was as simple as going to the hardware store, purchasing light bulbs (yes they were more expensive than traditional bulbs, but I have already made my money back) and replacing my existing ones with LED bulbs. At any rate, we are very excited to begin this project and we could not have done this without your continued support of our schools, our students, and our mission. We will provide updates as we have them. Enjoy the rest of the week, and I hear that I could be in a t-shirt again by the weekend! Veterans Day: I am very proud of our students and how they recognize our Veterans each year. Each of our elementary schools do something special, our middle schools who have an even deeper understanding write or visit with Veterans, and our high school marching band members march in the Veterans Day Parade at the New York State Fairgrounds. It is always wonderful to meet and reconnect with so many Veterans who attend our recognition ceremonies as well. Thank you to all Veterans for your service! Swim Team Breaks Records: Our girls swim team capped off an awesome season by winning the Section III title and also breaking a pool record. Their success is just unparallelled in the pool and we are very proud to call these young ladies Wildcats! The 400 Freestyle Relay team of Brianna Smith, Rebecca Kanoza, Sinead Guy, and Olivia Castro won the title and broke the pool record. Also winning an individual title was Olivia Castro in the 200 Freestyle. In the state qualifier this weekend the team of Brianna Smith, Erin Dowler, Shannon Cahalan, and Olivia Castro came in second, but they did qualify the 200 medley relay for states and Castro won the 200 free. The school record was broken in the 400 free relay by the team of Kaitlin Dunning, Sinead Guy, Rebecca Kanoza, and Olivia Castro, as they won with a time of 3:40.16. Seven girls advance to the states in the 200 medley relay, 200 free relay, 400 free relay, and Olivia Castro in the 100 and 200. Congratulations! Winter sports begin today, and we are excited for what is to come in the gym, on the wrestling mats, and on the ice! The schedules can be found on our website, and the students really enjoy playing in front of a crowd. District Spelling Bee: West Genesee Middle School eighth grader, Jason Loustaunau faced-off against Camillus Middle School seventh grader, Rose Hays spelling such words as "caricatured" and "unilaterally" until Loustaunau emerged as the first place winner in the West Genesee Spelling Bee held on November 7. To see a list of the Top 12 moving on to the next level, click here. The Commissioner Speaks in Syracuse: Last week Dr. King, the Commissioner of Education, made a listening tour stop at WCNY studios. Tickets were handed out on an application and lottery system basis. 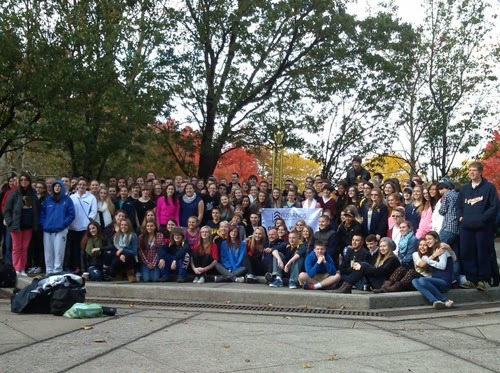 West Genesee was fortunate that several administrators, teachers, and parents were chosen to attend. They spoke well and asked some great questions. Hopefully they were listened to AND heard, instead of just listened to. He is scheduled to have a second Syracuse stop sometime in December. Once I know the location, I will pass that information on to you. November is "No Shave November" and I am trying to be a good sport with some of the high school students who are participating. They do not have to wear dress shirts, be on television, or represent our entire school community, so I am going to see how long I can go before a trim is in order! If you are looking for a night out, please consider coming to our annual Harvest Dinner this Wednesday, November 13 at the high school. This dinner is orchestrated by students and the money raised is divided between several charities. Wildcat Band Marches to Success: In case you haven't heard, our Marching Band not only won the New York State Field Band Championships last weekend, but also won the USBands National Championship this past Saturday night. 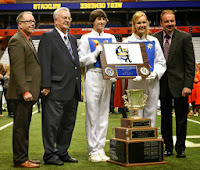 They scored a 96.25 in the NYS Field Band Conference Competition and then a 95.687 during the USBands National Championship. Consistent, remarkable, and probably an unreal feeling for all of the 170 band members. I cannot imagine the freshman members who at 14 years old are state and national champions in something so competitive and difficult to win. If you are wondering what kind of recruiting tools the Marching Band has, take a look at these trophies and not much more needs to be said. I wonder if there is a maximum number of members a school can have. In all seriousness, we always talk about what it takes to be a successful program. In a successful program, the group finds success or is in a position to be successful each and every year regardless of who the current members are. They practice with a purpose, are not afraid of hurdles, naysayers, negative people, or adversity. They protect their own and circle the wagons if one of the members needs help. Lastly, a successful program has no face. Success comes from the sum of its parts at all times and EVERYONE is equally important. 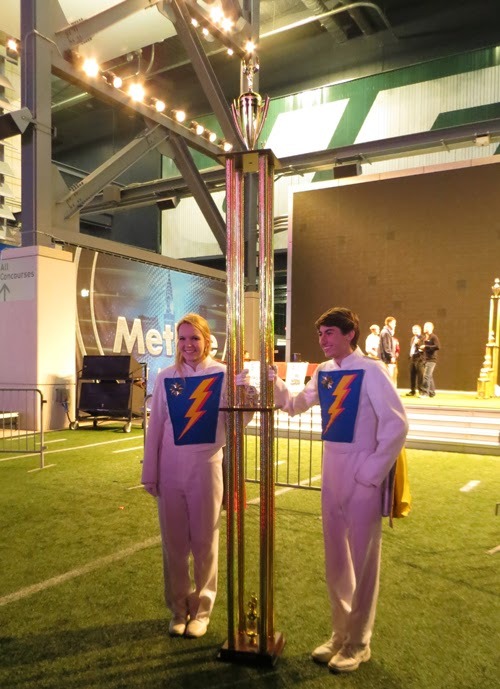 Our Marching Band exhibits all of these qualities and that is why they have been champions, are champions, and are poised to be champions in the future. Congratulations! Our cross country runners did well this weekend, and we are very proud of their efforts. Check out the Athletics webpage later today for details. The girls swim team continues to dominate. They established some pool records last week and are still rolling. Check out the Athletics webpage for details. I am also excited for our volleyball team. They will be playing in the Section III championship game on Wednesday night. This is the first time they have been in this position since 2008. I am really looking forward to how they respond to this game because they are playing their biggest rival (Baldwinsville). They have come so close to beating them in the past and it is going to take everything our girls have both mentally and physically to succeed. Best of luck! The Commissioner Speaks: This week the Commissioner of Education will be speaking at WCNY studios. The link to his visit can be found here (http://www.wcny.org/commoncoreprogramnov7/) and tickets are being given out on a lottery basis. A Busy Week Ahead: I have a week full of Capital Project presentations, committee meetings, classroom visits, and my monthly BOCES meeting. A lot to do but considering the success we continue to have, it will all be well worth it!